Sole: Like the previous version, the sole remains quite firm. That comes from Saucony's continued use of SL EVA. I would love to see some Powergrid in this shoe, but that would come with two trade-offs. Powergrid in my experience seems to wear out fairly quickly and the Fastwitch series lasts quite a bit of time. That may come from how firm the midsole is, which in my mind significantly delay's sole degradation. 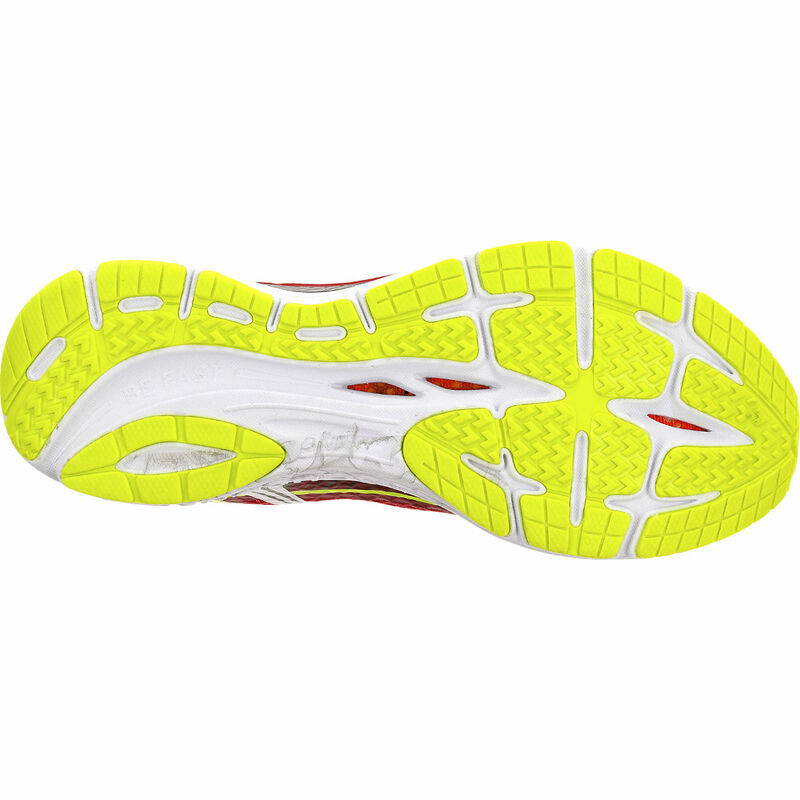 Saucony is also now using an outsole material called PWRTRAC in the Fastwitch, which both gives greatly increased traction and durability. After over 200 miles the sole is still holding up quite well and even more so than the previous version. The second thing is that the addition of Powergrid would likely add weight from needing more room in the sole for it's addition. The Fastwitch 7 sole is pretty thin and I do have to admit that a decent amount of protection is given despite the firmness. 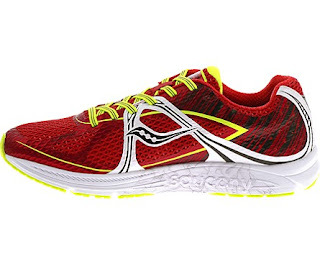 Being a lightweight stability racer, there is some posting on the medial side of this shoe. Version 6 has a pretty significant bump that felt jarring until you got used to the feeling. Version 7 has vastly improved on this by getting rid of the midfoot support bridge and relying on duel density foam only. The result in greatly increased flexibility in the sole with the same mild support leading to a much smoother ride overall. And for those worried about the support being too excessive, know that the ride is smooth and the support is not obtrusive. It does it's job and nothing more. A wonderful update from version 6. Upper/Fit: The upper fit is something I really liked about the Fastwitch 6 and some of that has carried over to the 7. Version 6 ran a bit small, so going up a half size was the requirement for getting an awesome fit. Plenty of room in the toe-box without feeling sloppy. The 7 is a bit narrower (which is relative given that my v7 is a size 10 and v6 was a 10.5), but the new flexfilm overlays adapt to your foot shape and hold onto the foot snugly. The Fastwitch 7 has one of those great uppers that you put on and forget about. Not too wide and not too narrower. There is a small heel counter in the back of the shoe, but it is fairly minimal and does not come up very high. This is in contrast to the fairly rigid and higher heel counter of version 6. Version 7 also has a softer inside and although I have not used it without socks while running, walking around feels great and I will try this at some point in the future. Responsiveness: As mentioned earlier, the sole is quite firm. A bit more responsive and less firm than the previous version, but not the lightweight propulsion feeling of something like the Takumi Sen or lighter racing flats. Responsiveness has been sacrificed a little for a bit of stability. You should still know that this shoe is fast because it is a racing flat. I have used these from short intervals to tempo runs that I ran too hard averaging 5:07 pace per mile. That said I would definitely use these in a half marathon rather than a 5k. That is my preference. Runners with support needs could definitely use this shoe from 5k up to the half or full marathon. 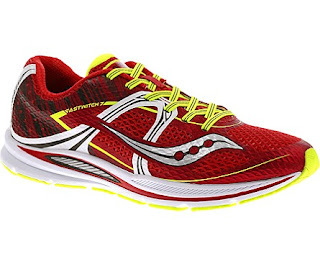 I personally have lighter neutral racing flats that I prefer for the shorter distances. Heel-Toe Drop/Ramp: This shoe is listed as a 4mm drop shoe and that's exactly how it feels. Not much else to say on that! Durability: Another bit mentioned earlier, this shoe is durable. 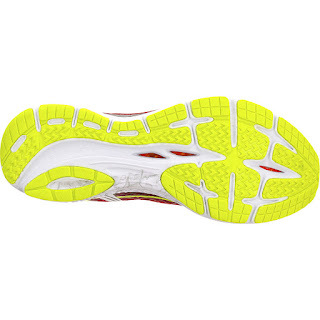 The POWRTRAC outsole has lasted me quite some time. My pair is going into the +200 mile range which is great for a lightweight racing flat such as this. Weight: While the shoe is listed at 7.2-7.3 ounces, it does feel lighter than that. In my mind it feels like a mid to high 6 ounce shoe. I personally have not measured the weight of each shoe, but they feel pretty light. Thoughts as a DPT (Student): Almost every aspect of this shoe has been improved in my mind. The heel has a bit more curve to it to smooth out landings. The low toe spring has been kept but the sole flexibility seems to have been improved for better transitions. The only minor thing that hasn't changed is the lateral forefoot sole flare. As I have mentioned in previous posts, sole flare describes how far the midsole/outsole extends out laterally from the shoe beyond where the foot/footbed sits. 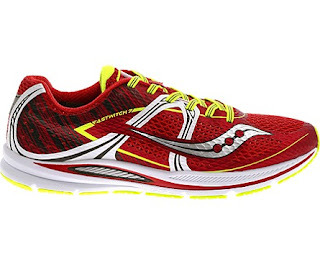 Saucony does tend to have flared soles and this can create a shoe that feels more stable. Why? Because a wider surface is inherently more stable. The problem arises when it causes premature contact. Premature is never a good word. Premature foot contact means the foot hits the ground a little early that it probably should. Additionally, lateral sole flare means not only does the foot hit the ground earlier, it also has farther to fall medially in the opposite direction. So lateral sole flare can increase the amount of eversion the foot goes through during the contact portion of the gait cycle. That puts a great deal of stress on the posterior tibialis, which has a longer distance to eccentrically control the medial rolling or pronation of the foot (pronation being a description of triplanar motion in the foot, not a description of something bad). That also means the first metatarsal head has a longer distance to fall as well if you are a forefoot striker, putting greater strain on the peroneus longus to try to maintain the arch with the posterior tibialis against the momentum. Sound complicated? Too much sole flare pitches your foot more. It also creates a more stable plateform. Most shoe companies will use medial sole flare to increase medial arch support. It's common. If you supinate instead of pronate (a very rare condition), lateral sole flare is great for you. Because that's probably the only time you're going to have a more solid way of deal with any supination issues. New Balance is the only company that makes a laterally supportive shoe with second density foam (usually that gray stuff on support shoe. It's higher density foam that slows down the foots role). And those shoes are very clunky and probably not the best shoe for running unless you really need them. Final Thoughts: Overall I really like this shoe. The Fastwitch 7 is a big improvement over the previous version. The sole is a bit more forgiving and responsive. There is no longer the sizing up requirement as the upper fits well (still try them before you buy them). The upper itself is more comfortable and I bet would be fine worn sockless. It is lighter, smoother and more flexible than the previous version. And the support is noticeable but not intrusive. I have thoroughly enjoyed doing workouts in this shoe and for those who like training full time in lightweight shoes I highly suggest giving this durable, lightweight, mildly supportive shoe a look. These shoes were purchased for their full US retail prcie. I put at least 100 miles on every pair of shoes before I review them (except racing flats which I put on at least 50 miles). Currently I have 204 miles on my pair (I waited a bit for this one). *Images obtained from the Saucony Running website. Go down to your local Run Specialty Retailer to check them out.